A previously withheld video has been released showing the near-constant heckling of Treasury Secretary Steve Mnuchin during a moderated talk about the economy at UCLA. The university initially balked at releasing the video, saying that Mnuchin “subsequently withdrew” his agreement for it to be posted online. The video shows audience members hissing at Mnuchin throughout the Feb. 26 event in Los Angeles. The hissing was so loud the secretary barely spoke a sentence without commenting about it. Seven minutes into Mnuchin’s opening remarks, three different women shouted at him and were either carried or escorted out of the room by police after they ignored warnings to stop. They yelled that the U.S. is bullying North Korea and criticized President Trump’s tax legislation. The decision to withhold the video drew criticism from students, free speech groups and members of the news media. Several organizations, including The Associated Press, filed public-records requests arguing for the video to be released. UCLA agreed to release the video on Friday, saying in a statement only that it had received Mnuchin’s consent to do so. Withholding the video at Mnuchin’s request and choosing to release it only after receiving his consent both are problematic decisions, said David Snyder, executive director of the First Amendment Coalition, one of the groups that argued for the release. Mnuchin or any other third party shouldn’t have any control over UCLA under California public records laws, Snyder said. A university spokeswoman did not respond to a request for comment on the criticism. In the video of Mnuchin’s remarks, the secretary at times makes jokes about the relentless hissing while at others he appears irritated. 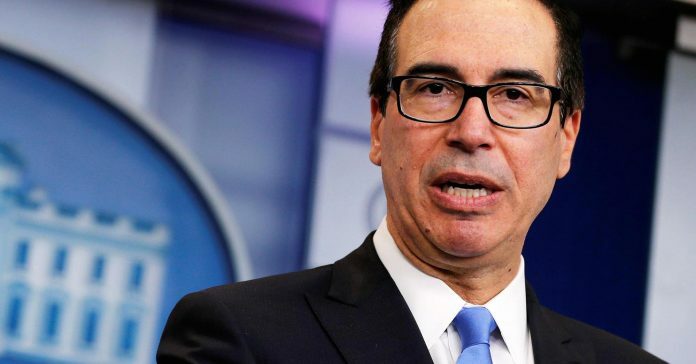 The hissing came after nearly everything Mnuchin said, including at one point when he spoke of his role to issue sanctions to other countries over human-rights violations. Mnuchin eventually asked the hecklers for “a little feedback” on why they hissed when he started talking about economic development.